It was the middle of the afternoon and we sat relaxing around the campfire when we heard the minivans driving up the track. 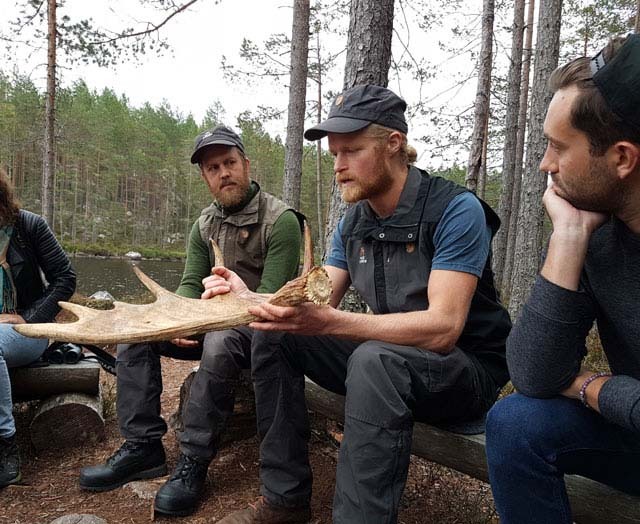 Our guides introduced themselves and said that we’d start off with driving to a spot in the forest to have an introductory chat and something to eat. An introduction to the world of the moose. Photo: Nature Travels. We were divided up into the two minivans and drove off. Not many minutes later one of our guides (who was driving the van I was in) said excitedly, “There are some moose! !” and at the same time trying to stop on the busy road. We parked up and quietly stepped out of the minivans and were handed binoculars. The moose we had spotted were a female with a one-year-old male calf. They were standing in a corner of the field looking at us, trying to decide if we were a threat or not. We got a good look at them before the female decided that she had enough and went into the forest shortly followed by the one-year-old. We all agreed it was a great start to the evening. 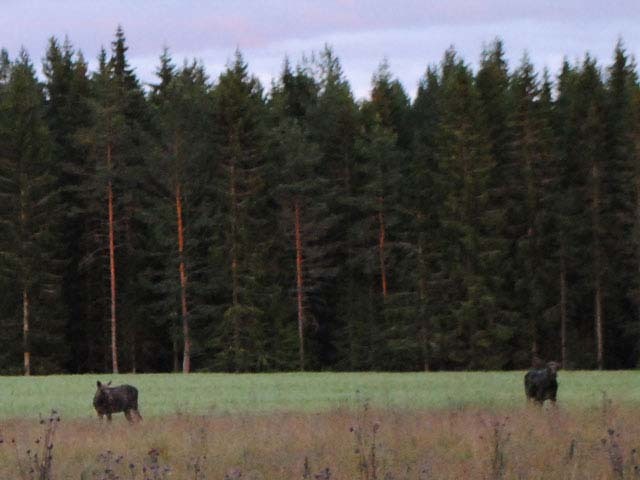 A pair of binoculars brings the moose even closer! Photo: Sofia Carter Nature Travels. We continued on and in the end we walked to a clearing in the forest next to a beautiful lake. Here we sat down for a while and our guides told us some moose facts! Did you, for example, know that…? After that, we went for a short walk looking for signs in the forest. We looked at tracks, berries, moss, whatever we found, we discussed. We even found a fox scull that some mice had gnawed on! 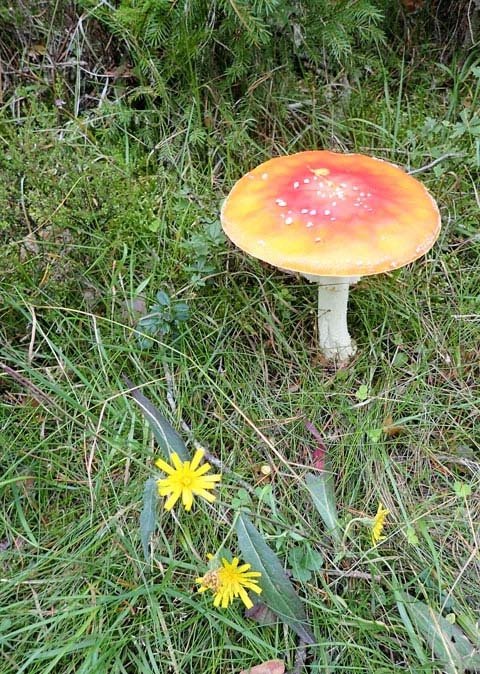 Moose are not the only interesting things one can find in the forest! Photo: Sofia Carter Nature Travels. It’s fascinating what you can find if you only look a bit closer at your surroundings. After the walk, we walked back to the clearing by the lake, the guides made us a warming fire and we enjoyed a lovely dinner around it. There’s nothing like enjoying a hot drink and some food around an open fire in a forest setting by a lake. 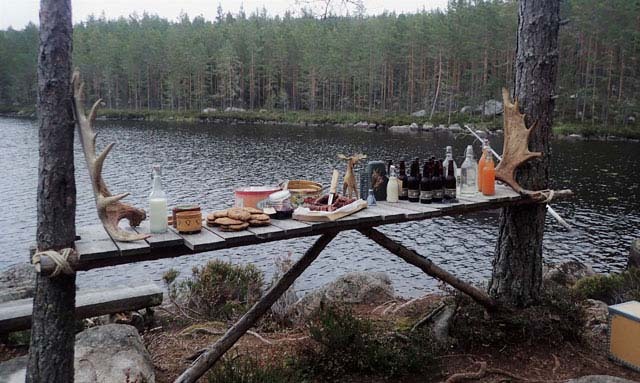 A wonderful wilderness dinner by the lake. Photo: Nature Travels. When our stomachs were full with food and our heads full with information, we headed back into the minivans to look for some more moose. We didn’t need to go far before we saw a large male standing in a clearing. A magnificent sight! All in all we saw 8 moose and a fox during the evening, one female and a calf really close to the vans. For some of them we managed to step out and look at closer with the binoculars, while others ran as soon as we tried to open the doors. 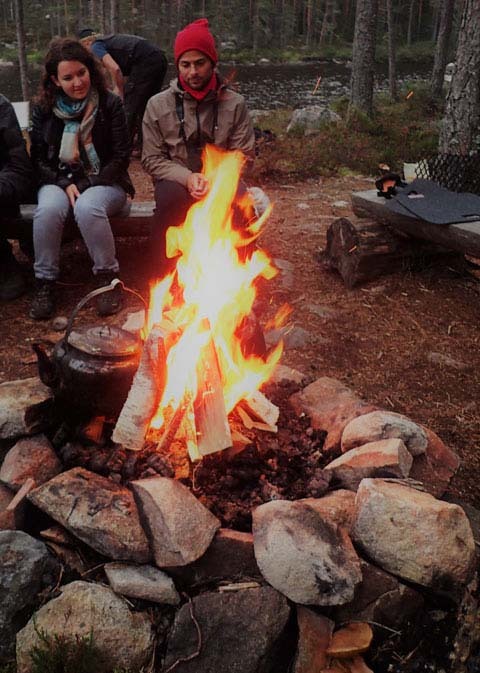 The evening ended almost as it started with a hot drink around a fire – but this time our guide was teaching us how to imitate the different moose sounds, including the noises the males make to to attract the attention of the females – this made us all laugh. Enjoying the fire. Photo: Sofia Carter Nature Travels. A great experience and a fun evening! Moose and Beaver Safari is a 4-day/3-night tour offered from May to September with unique accommodation in charcoaler hut. 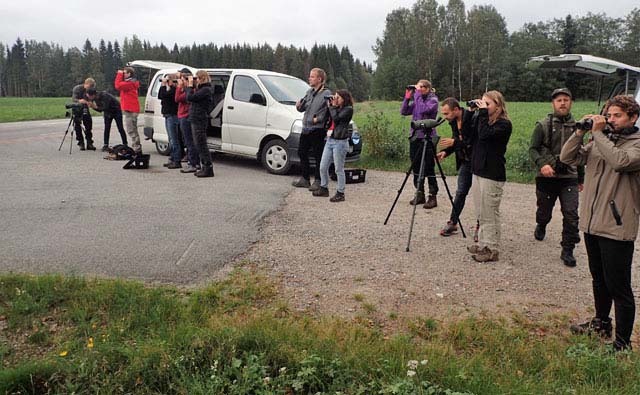 On certain dates, this programme can be extended with the addition of a Wolf Howling overnight tour.